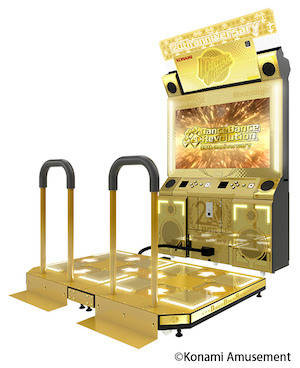 Konami has released the latest iteration of its Bemani classic, DanceDanceRevolution A20 in Japan. Pronounced “Ace Two Oh”, the 16th installment of the DDR series is presented in a golden cabinet with a 55ins HD screen. Upgrade kits for older, existing cabinets are to be made available at a later, as yet unconfirmed date. The game was originally announced the 8th Konami Arcade Championship finals for the game’s predecessor DanceDanceRevolution A, in celebration of DDR’s 20th anniversary. It features grade certification courses and a new Golden League mode.All previously unlockable songs are available by default with the exception of the Floor Infection track. There has been no announcement regarding the availability of the title outside of Japan at the time of writing.